In the past 10 years, the number of women entering the workforce in traditionally male-dominated jobs has increased by nearly 30%. More and more women are working as trade laborers, warehouse workers, equipment operators and such. It’s important that all employees, male and female, are taught the same rights and regulations regarding Workers’ Compensation. Many single moms are entering into fields that are statistically more dangerous, and they need to know what protection they and their families have in case of work related injury. Having an accident at work can be an extremely tough time, not only with the pain of your injury, but also the stress that can come from lost wages. The Workers’ Comp process can be daunting and confusing if you don’t know your rights. 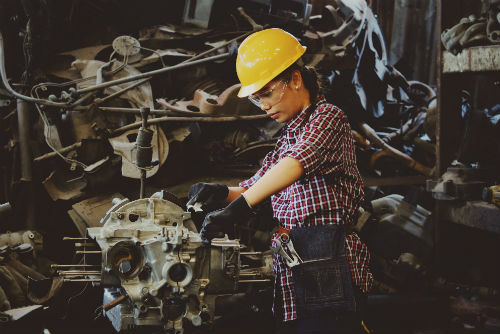 If you’re a woman who’s been injured in at work, whether it’s an office setting or on the factory floor, you’re entitled to collect your insurance benefits. Take a look at some of the basic facts that all workers should know about the Workers’ Compensation system. Throughout the U.S., the workers comp program is considered to follow a “no fault” structure. What that means is you will not have to prove that your employer is directly at fault for your accident. Your claim is considered on the basis of the injury you sustained, not the circumstances of the incident that occurred. Regardless of whether you might be partially to blame due to carelessness, this won’t impede or affect the decision-making process on your claim. The only exception to this rule is if you were found to be under the influence at the time the injury occured. You might not feel like your injury is significant enough to even bother reporting it. For example, you could feel fine and unhurt after a slip and fall accident but you should still report it. Injuries like twisted backs and joints might not show up for several hours or even days after the initial incident. Your best bet is to report even the smallest injury immediately to protect yourself from future issues with your claim. Once you accept your workers’ compensation claim, you become automatically exempt from any further legal action against your employers. However, this doesn’t prevent you from filing a further negligence lawsuit against a third party. For example, if you were to be injured in the workplace by a piece of malfunctioning machinery, you would still be able to file a claim against the manufacturer directly. So, if your regular claim won’t be sufficient to maintain your care, medical bills and lost time, there are other avenues to investigate with your legal team.